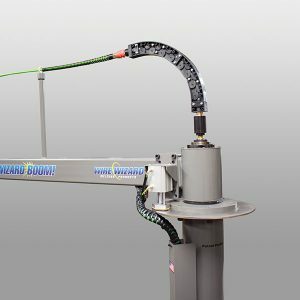 Wizard BOOM!™ Welding Booms feature the Wire Guide Module® System along with the Wire Pilot® Feed Assist to provide a versatile welding boom suitable for all types of wire. With superior wire pulling capabilities, the boom can even reliably feed soft 4043 aluminum wire without the need for a push-pull welding gun. 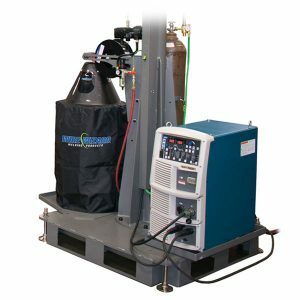 Fully articulated primary and secondary arms offer 280° rotation for excellent welder mobility & the portable base (optional) features fork pockets for easy handling. Portable Base for Wizard BOOM! The portable base for Wizard BOOM! 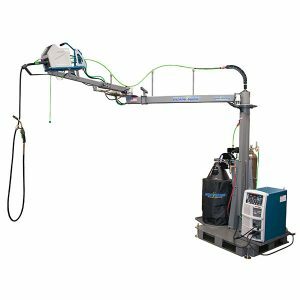 Welding Booms features fork pockets for easy handling along with built-in trays for the bulk wire package and power source. Heavy duty steel construction with adjustable floor levelers. Power source and wire package shown in photo not included.